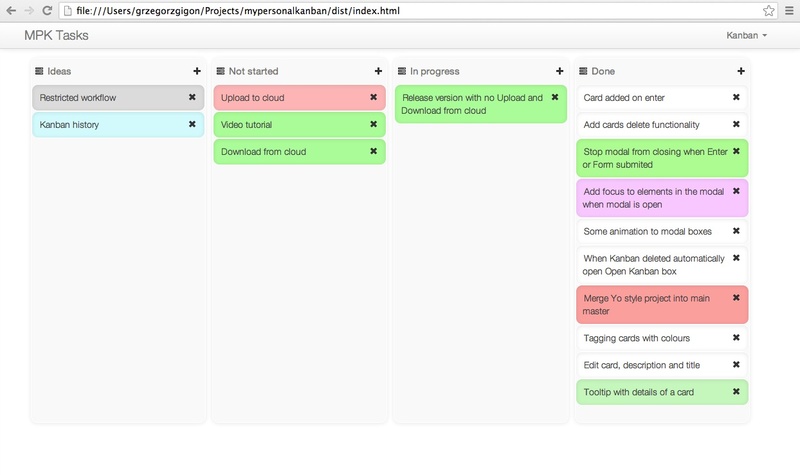 As you might already know I did a small application called My Personal Kanban, that serves as offline Kanban board. It’s HTML application which stores your Personal Kanban on your device. It free to use and Open Source. I just released a new feature and service for My Personal Kanban that allows you to Upload and Download your Personal Kanban Boards to Cloud. The service and functionality is in Beta phase but it would be great if you could give it a try and provide me with some feedback. Heres a video of how the Cloud features work. Here is the link to the previous post with Themes. 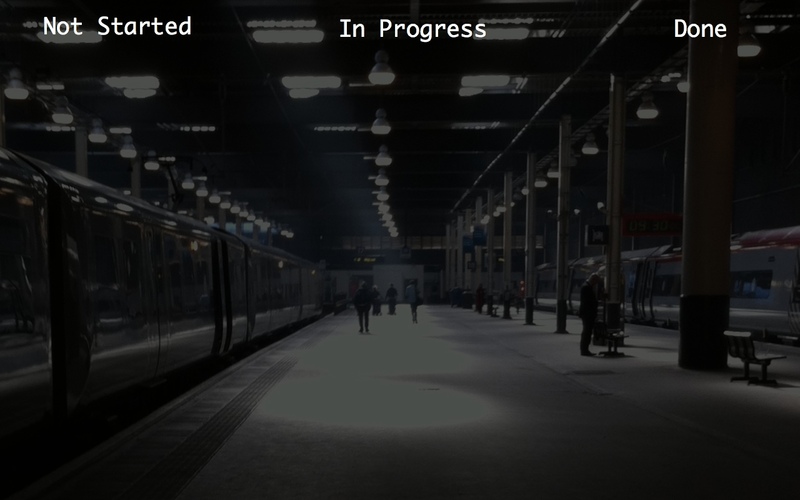 If you want to help me and contribute a Theme or some code, please do get in touch. I’ve posted about Kanban before (Free Kanban Board , Kanban), however this time I’ve created a little Kanban Board application that I started to use as my personal, sophisticated TODO list. My Personal Kanban is Free and Open Source for anyone to use. I’m a big fan of Kanban board. I prefer it over TODO list for all my professional and personal work. It’s clear to understand, doesn’t require extensive management process and most important offers great visibility of work. What I would like to focus on is how to do a cheap Electronic Board on Apple Mac without any additional software installed. If you got Mac you don’t really need anything more. I’m running OS X 10.8.3. 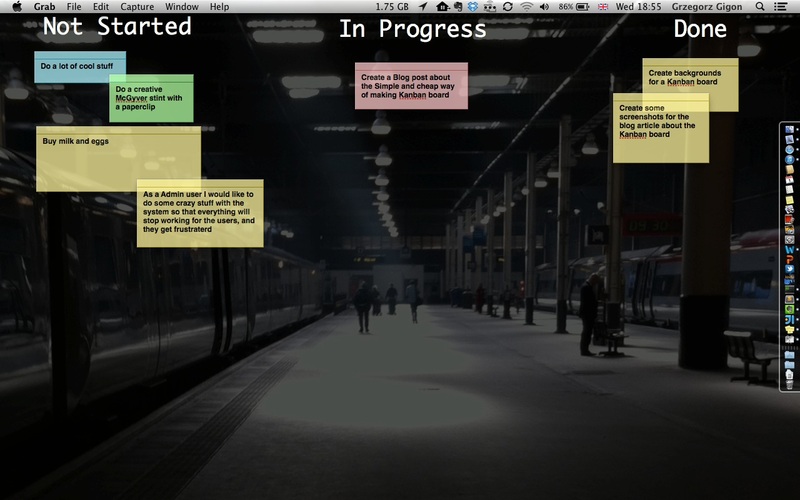 To make the Kanban board I used application shipped with OS X called Stickies and a custom made desktop backgrounds. First of all, I’ve created a new Desktop using Mission Control and setup Desktop Background to my Custom “Kanban Board like” wallpaper. 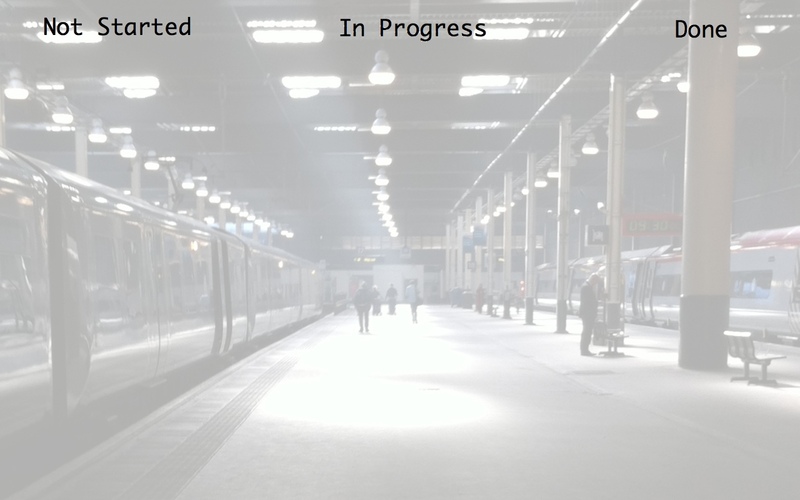 I’ve prepared two backgrounds, dark and bright, which you are more than welcome to use for free. My empty board is ready. All I need to do now is to add some Stickies onto it. Voila. You can modify color of a sticky and make it transparent. I’m using colors to distinguish between different types of tasks. Stickies on the top are the one with top priority. Once your Done column is full you can archive your Stickie by saving it and removing from the board.